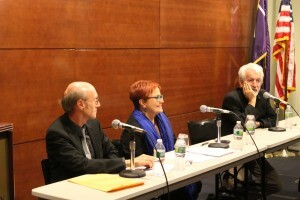 Roundtable discussion at the King Juan Carlos I of Spain Center, NYU. Photo courtesy of the Delegation of the Basque Government in New York. For forty-some years, until 1981, New York City was home to Picasso’s Guernica—painted in response to the destruction of the Basque city by the German Luftwaffe in April 1937. 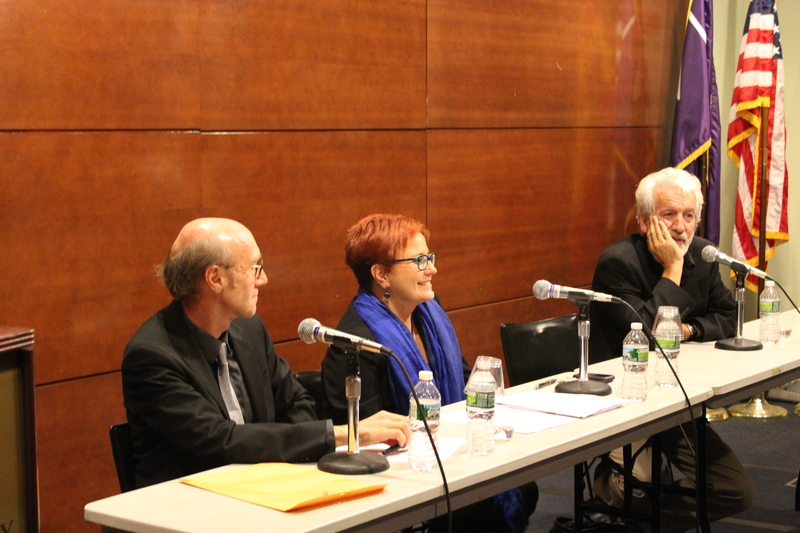 This past October, Guernica returned to New York symbolically as the city commemorated the 75th anniversary of the bombing with a program of events organized by the Etxepare Basque Institute, together with the Basque autonomous government, and with support from ALBA. The program included a round-table discussion, an exhibition at the King Juan Carlos I of Spain Center, and an outstanding selection of Basque films screened at the Anthology Film Archives. Franco’s dictatorship suppressed the use of the Basque language, ordered the burning of books in Basque and outlawed the use of Basque proper names. After Franco’s death, the Basques undertook a massive effort to revitalize their language and culture. Today, Basque nationalism is as strong as ever—witness the results of the recent regional elections, in which the parties in favor of independence won an ample majority. Basque nationalist sentiment—sometimes bordering on dogma and isolationism—was strongly represented in the commemorative New York program. The round-table Gernika Revisited provided a framework for understanding what Guernica symbolizes, despite the fact that much of the historical context of the bombing continues to be blurred. Key historical facts are still unknown, including the precise death toll. The attack on the Basque town is widely considered the first attempt to target a civilian population with large-scale, terror bombing. The Spanish Civil War gave the German air force an opportunity to test the effectiveness of “total air warfare,” whose primary objective was to break the opponent’s morale by killing of civilians. Guernica was harbinger of much worse to come. The bombing was also infamous for the way in which the perpetrators attempted to cover up their involvement. Both the Franco regime and their German counterparts initially denied any involvement. This mass deception helps explain why Guernica did not immediately evoke a greater moral outcry. The discussion following the round table revealed shocking facts. It turns out, for example, that one of the founders of the terrorist group ETA—which shaped one the darkest periods of Spain’s democratic history—was a so-called niño de la guerra: one of the thousands of children who were evacuated to other European countries to escape from the horrors of the war. (This is a story beautifully chronicled in Jaime Camino’s documentary Children of Russia.) Victims, in other words, became executioners; their history embodies the destructive effects of armed conflict. In fact, Professor Joseba Zulaika suggested a likely continuity between the violence of Guernica and that later employed by ETA. Revisiting Guernica brings up questions about terrorism, violence, and militarism that the international community has still not resolved. It is peculiar, for instance, to see how Guernica’s responsibility was denied while the destruction of Hiroshima, only eight years later, was openly accepted by President Truman as the “greatest achievement of organized science in history.” Maybe one of the explanations lies in the fact that the destruction of Guernica was never rationalized by its perpetrators. 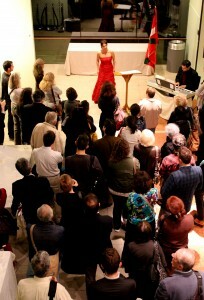 Special performance by soprano Amaya Arberas at the King Juan Carlos I of Spain Center, NYU. Photo courtesy of the Delegation of the Basque Government in New York. The cycle of Basque movies screened at the Anthology Film Archives showed that the death of Franco led to a new freedom in cinema, allowing filmmakers to address many aspects of the Spanish Civil War which had been silenced. The selection of films included The Good News (Helena Taberna, 2008) a true story of a young priest who witnesses the destruction imparted on a small village at the start of the civil war; Lauxaeta (Jose Antonio Zorrilla, 1987) another true story of a poet who finds himself as a commandeer during the siege of Bilbao; Children of Russia (Jaime Camino, 2001) mentioned earlier; the introspective Vacas (Julio Medem, 1992); and the surrealist Tree of Guernica (Fernando Arrabal, 1975). In one way or another, all these films continue in Picasso’s footsteps, documenting the horror of war. Why was Franco NOT tried as a war criminal for bombing his own people in northern Spain….just as the Nazis were tried after the war? It’s a long story, but the short answer is: The Cold War. Franco was allowed to stay in power after the end of WWII because he was seen as an important anti-Communist ally.